Anne and I of recent have seen patterns where teams are under pressure to perform and deliver, often in complex, chaotic and fast-paced environments and the one thing that can make or break the cohesiveness, resilience and performance of a team is the levels of trust, for each other, for colleagues and for their boss. If we further break down trust then there is one aspect that is proving to be the greatest contributor to team success and performance (see Insight 1 below) and that is psychological safety. Harvard professor Amy Edmonson defines Psychological Safety as ‘a belief that one will not be punished or humiliated for speaking up with ideas, questions, concerns or mistakes’ and from a team perspective ‘a shared belief that the team is safe for interpersonal risk taking’. – take a moment to reflect on these definitions and think about your culture, your team, your peers, your manager – how do you stack up? Australia is the first country to have measured psychological safety in the workplace and the survey results make for interesting reading. The Australian Workplace Psychological Safety Survey canvassed 1,176 Australian employees. Examples of responses include 58% of respondents agreeing that “My work colleagues often reject others for being different” and in response to“It is safe to take a risk at work” 38% of men strongly agreed/agreed, in contrast to the 29% of women who strongly agreed/agreed. From a work perspective, a ‘psychologically safe’ workplace is defined as ‘a climate of interpersonal trust and mutual respect in which people feel comfortable being themselves to make mistakes or take risks in their work’. These are essential conditions for creativity and innovation to thrive, for people to learn and grow (develop a Growth Mindset) and to feel comfortable working fully to their strengths. In 2000, neuroscientist Evian Gordon identified that the main job of our brain is to keep us safe – both physically and psychologically. 1. Trust has been identified as the foundation for high performing teams. This comes from the work of Patrick Lencioni and the 5 Behaviours of a Cohesive Team. This is further supported by the findings from Project Aristotle undertaken by Google. 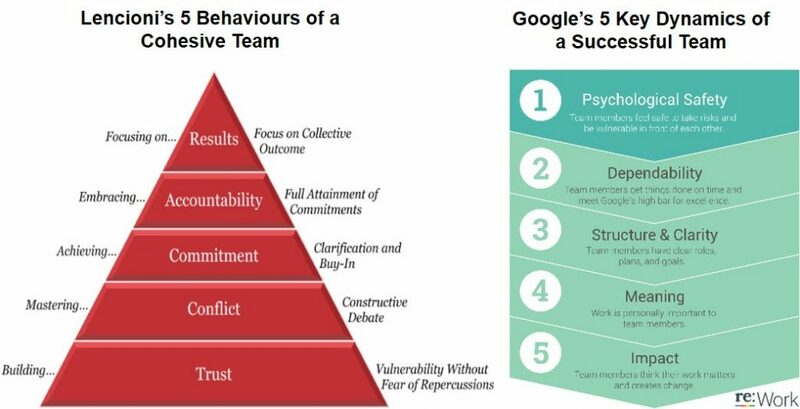 After 2 years, hundreds of interviews and extensive data analysis, Google identified that psychological safety (using the question “Can we take risks on this team without feeling insecure or embarrassed?”) was the number 1 predictor of team success. Edmonson identifies the consequences of not speaking up for fear of reprisal. “Silence in today’s economic environment is deadly. Silence means good ideas and possibilities don’t bubble up, and problems don’t get addressed. Silence stymies teaming”. Often the reason we stay silent is because nobody wants to look ignorant, incompetent, intrusive or negative but by staying silent we rob others of opportunities to learn, grow and speak up for themselves. 2. Psychological safety is central to inclusive cultures. According to diversity and inclusion expert Dr Karen Morley, our similarity bias (see previous Brainbuzz on Unconscious bias) leads us to feel more comfortable working with people who are similar to us and less trusting of those who are different, so it’s essential for leaders to foster a climate of psychological safety to ensure that the benefits of diversity such as creativity, innovation and productivity are harnessed not stifled. 3. Approximately half of all managers don’t trust their leaders. Research carried out by Dr Bob Hurley author of ‘The Decision to Trust, how Leaders create High Trust Organisations’, identified that a distrustful environment can bring organisations down. Hurley has created a trust model that identifies ten factors, three from the position of the ‘truster’ and seven from the perspective of the ‘trustee’ that, when addressed, can build trust. It also predicts whether an individual will choose to trust or distrust another in any given situation. Be congruent in word and deed – role model dependability by doing what you say you will do. In Dr Bob Hurley’s research one of the main reasons managers don’t trust their leaders is because, despite being well intentioned, they do not follow through on their word which leads to distrust. In his book ‘The Speed of Trust’ Steven MR Covey shares stories of significant deals that were conducted on a handshake alone, many of them by Warren Buffet. Trust facilitates the speed and reduces the cost of business. In her TEDx talk Amy Edmondson explains how psychological safety and accountability interact to produce a high-performing team in an environment where there’s uncertainty and interdependence. Leaders who allow for questions and discussions and also hold their employees accountable for excellence fall into the ‘learning zone’, or the ‘high-performance zone’. By contrast, leaders who only hold their employees accountable for excellence without creating psychological safety fall into the ‘anxiety zone’, which Edmondson says, can be dangerous. And leaders who only create psychological safety without holding their employees accountable for excellence remain in the ‘comfort zone’, which isn’t typically the highest performing. From the perspective of the brain, when we experience trust we release a hormone called oxytocin. This neurotransmitter has an anxiolytic (anti-anxiety) effect and protects the intestine from damage which serves to reduce stress levels. When trust is betrayed the fear centre of our brain is activated, the amygdala, and we revert to self-protection and hyper sensitivity which impacts our ability to think clearly and rationally. If broken trust is related to a breach of fairness, then our insula is activated which creates a visceral response in the body and again activates our amygdala and we are more likely to revert to fight and aggression. Building a psychologically safe environment is another example of ‘making the soft stuff hard’. If we want to empower our people to deliver, if we want to harness creativity, encourage innovation and accelerate the speed of business, it’s time to count on the positive cost of trust.